After sampling an embarrassing version of the Cobb salad at the Hollywood Brown Derby restaurant in Orlando, I’m on a quest to simply find a good Cobb salad. I had a hankering for a salad, but I didn’t want to go too far from home. 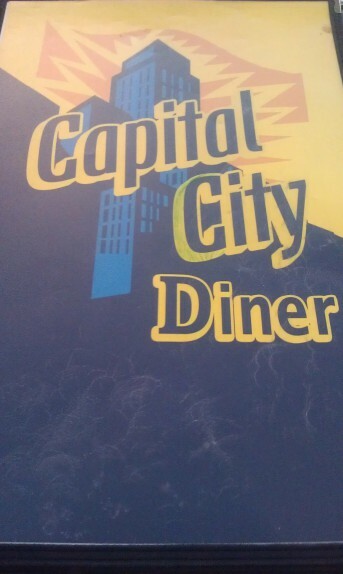 I noticed the Capital City Diner had a Cobb salad on the menu, so I went for lunch on a Saturday. The smell of pancakes and syrup in the diner really made it difficult to commit to the salad. But here I am, dedicated to an important quest. 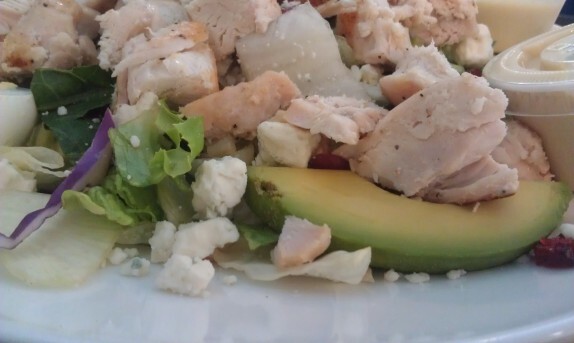 Right away, we can see that they don’t hit all of the elements of the EAT COBB mnemonic (Egg, Avocado, Tomato, Chicken, Onion, Bacon, Blue cheese). At the Capital City Diner, they completely forgo the bacon, onion, and tomato and substitute dried cranberries. It’s a bit of an odd substitution, but I was willing to try it. I ordered the massive dinner portion for $10. I was prepared for the presentation not being perfect, but I was disappointed to see overboiled eggs. Surprised, no. Disappointed, yes. The lettuce was predominantly iceberg, but there was some romaine mixed in there. The blue cheese was relatively flavorless, and the chicken was tasteless and overcooked. The avocado slices were fairly underripe. 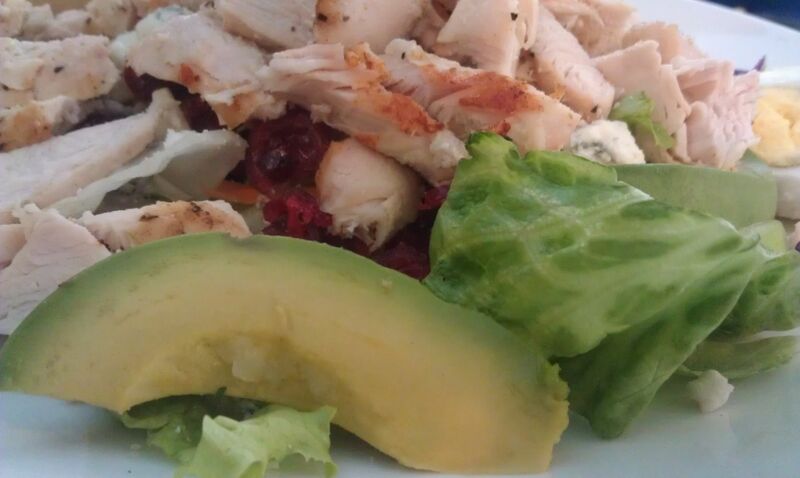 The cranberries gave this salad some flavor, and if not for this and a couple of splashes of honey mustard dressing, this would have been difficult to finish. I can’t say it was very good, and I really can’t say that this was even a Cobb salad, so I’m going to have to give it 0 out of 5 on the Bob Cobb Brown Derby scale. 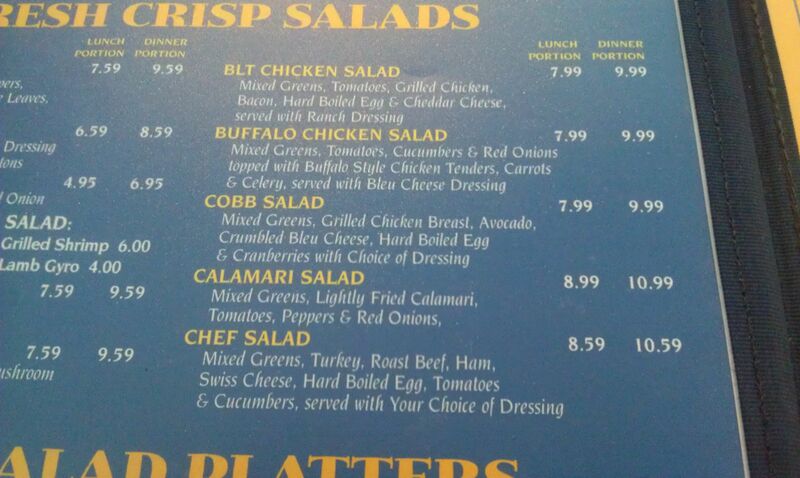 I’m also a fan of the Cobb Salad. The best I’ve had so far is at the Cafe One Eleven, (111 Washington Ave.) Their version is all Romaine, grilled chicken, bacon, blue cheese crumbles and hard-boiled eggs. They make it to order. I’m not a salad guy, but I’ve had this a number of times. P.S. Just discovered your site, and like it. Thanks for the tip; I’ll have to check it out! And thanks for reading; I love sharing insight! 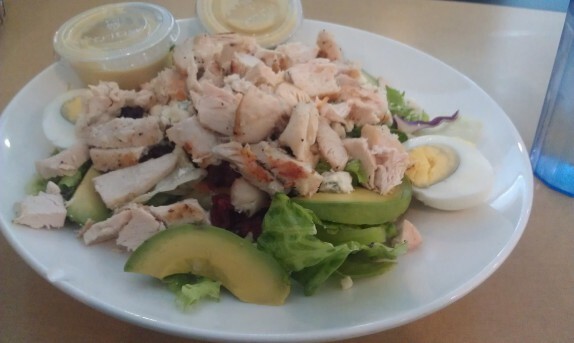 You got me looking into the original Cobb Salad, and I see among a few other things, my favorite is missing avocado and tomatoes. Unless tomatoes are really good, I’m not missing them, and at $6.95 for a large salad, I don’t blame them for skipping the avocado. I’d prefer French dressing, but I’m okay with Thousand Islands as a substitute.